1859: the first anthracite coal breaker in America, the Racket Brook Breaker, was erected by the D&H, adjacent to the company's coal and rail operations in the vicinity of the Artesian Well. There are ten cities/communities in the United States with the name Carbondale. Many years ago, the Historical Society installed an exhibition of paintings and photographs of the mayors of Carbondale in City Council Chambers. This project was initiated by Society Treasurer Joseph Pascoe. There are several mayors' portraits, some from the nineteenth century and some from the twentieth century, that we have not been able to locate. If you have access to photographs of any Carbondale mayor, please contact the Historical Society. The Maplewood Cemetery Association has partnered with the Carbondale Historical Society, the City of Carbondale, and numerous volunteers to work on the ongoing restoration of Maplewood Cemetery in Carbondale, PA. Phase One of the project was the clearing of overgrown weeds, brush, grass, and debris. Phase Two, which is the restoration of stones and monuments, started in the summer of 2009. Phase Three will be the replacement of the Cemetery's retaining wall along Cemetery Street and the restoration of the Cemetery Gates. Maplewood Cemetery was established in 1831. The first burial took place on October 31, 1832. On May 15, 2010, A Highly successful clean-up/maintenance project took place in the cemetery. Volunteers from a broad range of community organizations spent the day working in the cemetery. Astonishing progress was made. Donations for this restoration project may be sent to the Maplewood Cemetery Association, P.O. Box 151, Carbondale, PA 18407. If you would like to volunteer to work on this restoration project, contact the Historical Society at 570-282-0385. Miss Helen Kane, who died 24 October 2010, is the late daughter of the late Michael and Ellen (Gilboy) Kane, 71 Scott Street, Carbondale. After graduating from St. Rose High School, and Marywood University (B.A., M.A. ), she taught, initially, in Binghamton and in the state of Maryland. Miss Kane then became a member of the faculty of the Department of Defense Air Force School, and taught abroad (Newfoundland, England, Germany, Spain, Japan, the Philippines, and South Korea) for many years the dependents of American servicemen, and the dependents of those engaged in the United States diplomatic service, government construction work, and other government services abroad. During her two years of teaching in Japan--at Tachikawa, 25 miles from Tokyo--Miss Kane learned the fine art of creating Japanese dolls by attending classes conducted by one of the top experts in that field. Miss Kane then made 11 exquisite Japanese dolls. They are Boy's Day doll, Farmer Girl, Koto Player, Mama-San, Bride, Lion Dancer, Flower Girl, Samurai, Geisha, Merchant's Daughter, Rain Children. Those eleven dolls, each hand-made of exquisite silks and brocades, and perfect to the minutest detail, as well as three Oshie dolls (dolls framed as pictures), were donated to the Carbondale Historical Society in April 2010. The Japanese Doll exhibition at the Historical Society is open to the public weekdays from 1P.M. to 5P.M. and by appointment. The Society's telephone number is 570-282-0385. On October 2, a guided historical tour of Maplewood Cemetery took place under the direction of members of the Maplewood Cemetery Association. The tour took place in conjunction with a ride on the ninetenth-century trolley replica that is owned by Lackawanna County. The members of the cemetery tour, which was sold-out, boarded the trolley at Carbondale City Hall and were transported to the Cemetery for the tour. Following the guided walking tour through the Cemetery, the members of the tour were transported back to City Hall. Twenty-three burial sites/tombstones were visited: William Wurts, James and Margaret Russell, Alice Voyle Rashleigh, Magdalene Davies, Mary Davies, Philo C. Gritman, Joseph B. Van Bergen, Thomas Gillespie, Alexander Bryden, James Dickson, C. E. Rettew, Eleanor P. Jones, George J. Davies, Moon family, William Emmett Kirby, Solomon Bolton, Joseph Alexander, Daniel Scurry, Alfred Pascoe, Joseph Birkett, Frank Hollenbeck, Peck Family, and Von Beck family. Now available at the Historical Society is the next chapter in the Images of America Series. Available for $20 per copy, and at Amazon.com. This building, located on Salem Avenue in downtown Carbondale, is the former Masonic Temple. It is currently for sale. It is an architectural treasure that must be preserved! It has a few problems at present, but nothing that can't be solved. Contact the Historical Society at 570-282-0385. The Valley Advantage published a front-page article on the new book, with much praise. The link can be found above and in the Images of America Facebook feed. The Society's annual Christmas Dinner took place on Monday, December 6, beginning at 6 P.M. at Pettinato's Restaurant. The restaurant is located at 78 Dundaff Street, Carbondale. Menu selections consisted Veal Marsala and Baked Ham. Reservations were coordinated by the Society's Treasurer, Joseph Pascoe. The Society's annual Christmas Dinner, together with the annual Crystal Band concert, are regarded by many as the unofficial beginning of the Christmas season in Carbondale. The original of this rare and wonderful photograph is in the collection of Dean Cerra, Greenfield Township, PA. The band is shown here in front of the building, still standing, at the corner of Hospital Street and Apple Avenue. The bar that was owned and operated by Luigi Cerra is seen at the far right of the photograph. Luigi Cerra, who is very probably one of the musicians shown here, was one of the constituent members of Our Lady of Mount Carmel Church, Carbondale. He was the great grandfather of Father Louis Pascoe (Fordham University, New York City), Joseph Pascoe (Carbondale) and Ronald Pascoe (Carbondale), the three sons of Santo A. Pascoe and his wife Rose M. Cerra, of 36 Hospital Street. Please contact the Historical Society if you can identify any of the persons shown in the above photograph or if you can tell us more about the Mount Carmel Band. Fresh Daffodils and Leeks are the hallmarks of any St. David's Day gathering. Barbara Campbell presents a very touching and amusing reminiscence of her welsh grandmother. Ted Frutchey presents a comprehensive report on upcoming Welsh events in the Lackawanna Valley. 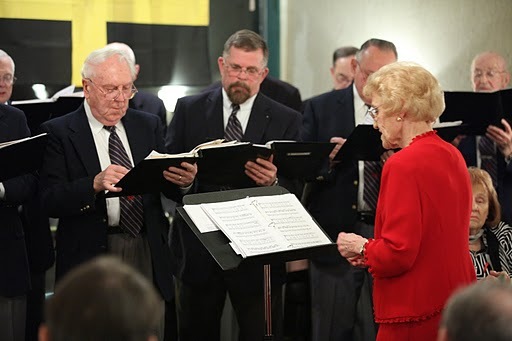 Mrs. Fran Justin conducts the St. David's Welsh Male Chorus in a program of traditional welsh music and selections from the Broadway show "Oklahoma"
Freshly brewed tea and Welsh cookies are always a hit with the dinner guests. A large group of Welsh enthusiasts enjoy the traditional celebration. Ted Frutchey, Donald Powell, Jerry and Patty Williams enjoy the evening. S. Robert Powell presents a report on the pioneer Welsh settlers in Carbondale. This Samuel Davies tombstone is one of the three very early Welsh tombstones in Maplewood Cemetery, Carbondale. As you can see in the photos above, Samuel Davies was born in Llanguic, Wales, and died at the age of 26 in 1833. Over 7,000 interments have been made in Maplewood Cemetery in the past 180+ years, but these three Welsh stones are the only ones in the cemetery that are made of this beautiful reddish/brown stone, on which the inscriptions are as clear and readable today as they were on the day they were carved, by a highly skilled stone carver (surely a Welshman). What is the material out of which these tombstones are made? Is this a Welsh stone? Did these early Welsh people who came to Carbondale to work in the anthracite mines here bring with them from Wales the stones that would ultimately become their tombstones? We would very much like to hear from anyone who can help us answer these unanswered questions about these stones. One of the Welsh tombstones in Carbondale's Maplewood Cemetery. This stone marks the grave of Mary Davis, who died on January 30, 1832, at the age of 44. She was the wife of the Reverend John Davis. The Reverend John Davis and his wife Mary were among the twenty Welsh families who were brought to Carbondale from Wales by the Delaware and Hudson Canal Company in the late 1820s for the specific purpose of teaching the D&H the techniques and procedures of deep underground anthracite coal mining. Eleanor Pritchard Jones, who became a celebrated teacher of the deaf, was born in Carbondale on March 4, 1883. She was the daughter of Carbondale Alderman Samuel Sheldon Jones and Margaret Gillespie Russell. The Jones family lived at 14 Darte Avenue. A graduate of Carbondale High School (1901) and Blair Hall, Blairstown, NJ, Miss Jones trained for teaching the deaf under Miss Ada R. King at the Pennsylvania State Oral School, Scranton, from 1902 to 1904, and in September 1904 she began teaching the deaf at that same school. At the same time, she continued her professional training by attending summer schools at Northwestern University, the Central Institute of Saint Louis (under Dr. Max Goldstein), the Russell Sage Foundation, NY, and Johns Hopkins University. Her work at those four schools, together with extension courses through Columbia University, New York University, the Pennsylvania State College, and the University of Pennsylvania earned Miss Jones a Class A teacher’s certificate for academic work from the Conference of Executives of the American Schools for the Deaf, Inc., on August 30, 1949. From 1904 to 1956, Miss Jones taught at the Pennsylvania State Oral School in Scranton and, at the time of her retirement, was the Supervising Teacher of Speech and head of the Auditory Department. Following her 52 years of teaching in Scranton, she accepted a position as speech therapist at Saint Mary’s School for the Deaf, Buffalo, NY, where she taught from 1961 to 1967. Miss Jones was a member of the First Presbyterian Church of Carbondale for 71 years, having taught a Sunday School class there for 40 years. In 1929, she wrote the Centennial History of that church. When the present First Presbyterian Church was erected, Miss Jones endowed a pillar in the main sanctuary in memory of her parents, Alderman and Mrs. Samuel Sheldon Jones. In 1969, at the time of the 140th anniversary of the founding of Carbondale’s First Presbyterian Church, Miss Jones, together with Minnie A. Moyle and Marion M. Doud, were the three most senior members of that church, all three having become members in 1899 or before. She had a lifelong interest in ornithology and traveled extensively to observe and study birds in the wild, all the while adding additional species to her carefully documented life-list of avian species observed in the wild. She was an enthusiastic member of the Scranton Audubon Society, and for 35 years taught ornithology classes for the Society. In 1909, Miss Jones, sailing on the White Star Line’s Cretic on June 26th from New York, was a member of a 64-day summer European tour (Italy, Switzerland, France, Holland, England, Scotland, Ireland) organized and conducted by H. W. Dunning & Co. of Boston. She was a member of the Saint David’s Society of Scranton, Elkview Country Club, the Scranton Wild Flower Club, the Century Club of Scranton, and the New Century Club of Carbondale. She was a voracious reader and enthusiastic bibliophile, her library containing many thousands of volumes. In 1987, 157 volumes of literary, historical, and intellectual classics were donated to the library at Mountain View High School, Kingsley, in memory of Eleanor Pritchard Jones. Miss Jones’ interest in genealogy, notably her Welsh and Scottish ancestors, was great. Her genealogical research, both in this country and in Great Britain, was extensive and professional. Her published articles about her forbears are of the highest quality. The lives of a great many people were profoundly impacted for the better by Eleanor Pritchard Jones, one of a great many distinguished teachers born, raised, and educated in Carbondale. Miss Jones died on February 6, 1970, and her earthly remains were interred in the Jones plot in Carbondale’s historic Maplewood Cemetery. Posted on July 13, 2015 by Robert Powell and filed under Archived.